Canada commenced its responsibility as an executive board member of the UNICEF’s Executive Board on 1 January 2019. North American Free Trade Agreement (NAFTA), an agreement to form a trade bloc between Canada, Mexico and the United States, came into force on January 1, 1994. NAFTA was commenced to eliminate restrictions on the flow of goods, services, and investment in North America. Canadian Broadcasting Corporation (CBC), national public radio and television broadcaster of Canada, established a news service known as CBC News in 1941. CBC News, the largest news broadcaster in Canada, was founded on January 1, 1941. Kathryn Gray, a 10-year-old girl from Canada, became the youngest person to discover a supernova - an exploding star which can briefly outshine a whole galaxy. The supernova was discovered on January 2, 2011. A research by Canadian and American scientists suggested that dinosaur egg incubation periods were more similar to reptiles rather than their descendants, birds. Their findings were reported in Proceedings of the National Academy of Sciences on 3 January 2017. Canadian researchers and a global team of astronomers have uncovered the cosmological source of a sporadically repeating milliseconds-long “fast radio burst.” Once thinking these bursts had emanated from within the Milky Way galaxy, or from cosmic neighbours, the astronomers now confirm that they are long-distance flashes from across the universe – more than 3 billion light-years away, according to a new report published on 4 January 2017 in the journal Nature. University of Alberta researchers have concluded from recent fossil finds that some species of dinosaurs probably had large fans of feathers at the end of their tails like peacocks. The research findings were published on 4 January 2013 in the journal Acta Palaeontologica Polonica. Canada won the 2015 World Junior Ice Hockey Championship beating Russia 5-4 in a heart-stopping final. Canada captured its fifth straight World Junior Ice Hockey Championship gold with a 5-1 victory over Team Sweden in front of a record crowd on January 5, 2009. Canadian actress Sandra Oh won the Best Actress in a Television Series award at the 76th Golden Globes awards on 6 January 2019. Red squirrels living in a low-stress environment harbor healthier communities of micro-organisms, a result that might hold implications for human health, according to a study by Canadian and Austrian researchers published in the journal Biology Letters on 6 January 2016. Canadian Milos Raonic defeated Swiss legend Roger Federer to claim his Brisbane Tennis title on 10 January 2016. Canadian-Chinese duo Gabriela Dabrowski and Yifan Xu won the 2018 Sydney International Tennis women’s doubles tittle beating Latisha Chan and Andrea Sestini Hlavackova 6-3 6-1 in the final. An international research team from Canada, the USA and England have found that mother-daughter reproductive conflict may be the cause why killer whales are one of only three known species of mammal, including humans, go through the menopause. Their findings were reported in the journal Current Biology on 12 January 2017. Professor Nahum Sonenberg from McGill University, Canada was named as the winner of the Wolf Prize in Medicine on 16 January 2014 for his discovery of the proteins that control the protein expression mechanism and their operation. Canadian Jennifer Coosemans won the 2016 Miss Chinese International beauty pageant in Hong Kong. Canadian singer and former Miss Canada finalist Mary-Lu Zahalan-Kennedy became the first person in the world to graduate with a Masters degree in a program that studied The Beatles - an English rock band from 60's. Twelve full-time students joined the Master of Arts course in The Beatles, Popular Music and Society at the Liverpool Hope University and Mary-Lu was the first to graduate on 26 January 2011. Canadian climber Will Gadd became the first person ever to scale the frozen waters of Niagara Falls on 27 January 2015. An international team of researchers, including scientists from Canada, have identified fossilized remains of four ancient snakes between 140 and 167 million years old, rolling back the clock on snake evolution by nearly 70 million years. They have described these oldest snake fossils on 27 January 2015 in the journal Nature Communications. Canadian Gabriela Dabrowski and Croatian Mate Pavic won the mixed doubles Australian Open Grand Slam title on 28 January 2018 defeating Rohan Bopanna and Timea Babos 2-6 6-4 [11-9]. Canadian and Russian researchers have discovered the oldest, 7,000 to 8,000 years old, set of confirmed human twins during a field research in a Siberian cemetery. The researchers’ findings were published in the journal Antiquity on 30 January 2015. Scientists from Canada, Taiwan and China have discovered soft tissue sample inside a 195-million-year-old rib of the sauropodomorph dinosaur Lufengosaurus. The dinosaur fossil was discovered in China's Yunnan Province and was detailed in the journal Nature Communications on 31 January 2017. The United Nations (UN) on 3 February 2017 announced the appointment of Susan McDade of Canada as Assistant Administrator and Director of the Bureau for Management Services at the United Nations Development Programme (UNDP). Canadian and Spanish scientists have discovered a cave-dwelling new species of insect, Haplocampa wagnelli, in British Columbia in Canada. The insect, could be a survivor from the last ice age, was reported in the journal Subterranean Biology on 5 February 2019. A team of international scientists, including researchers from Canada, has discovered more than 450 ancient earthworks in the western Brazilian Amazon, as reported in the Proceedings of the National Academy of Sciences on 6 February 2017. Canadian scientist from the University of Toronto along with an international team have identified brain chemicals that allow seals to sleep with half of their brain at a time, according to a study published on 6 February 2013 in the Journal of Neuroscience. The discovery may help millions — including an estimated 40 percent of North Americans — who suffer from insomnia or other sleep disorders. Canadian Justine Dufour-Lapointe won gold in Ladies' Moguls at the 2014 Olympic Winter Games. A genetically-engineered virus tested in 30 terminally-ill liver cancer patients significantly prolonged their lives, killing tumors and inhibiting the growth of new ones, Canadian scientists along with their international colleagues reported on 10 February 2013 in the journal Nature Medicine. Canadian photographer Finbarr O’Reilly was named the winner of the 49th annual World Press Photo Contest on 10 February 2006. The winning picture shows the emaciated fingers of a one-year-old child pressed against the lips of his mother at an emergency feeding clinic in Niger. A three-month-old baby received Canada's first successful liver transplant at Montréal's Notre-Dame Hospital on February 12, 1970. The 1988 Winter Olympic Games were held in Calgary, Canada from February 13 to 28, 1988. They were the first Olympic Winter Games hosted by Canada. Researchers at the Human Media Lab, Queen's University, Canada have developed the world’s first full-color, high-resolution and wireless bendable smartphone, as announced on 16 February 2016. Canada won the mixed Curling gold at the Lillehammer 2016 Youth Olympic Games with a 10-4 victory over the United States. Justin Kripps and Alexander Kopacz of Canada won 2-man gold at the Pyeongchang 2018 Winter Olympics. Canadian drama film Mommy directed by Xavier Dolan won the Best Foreign film award at France's César Awards on 20 February 2015. Scientists from Canada and their international colleagues have determined that the modern-day armadillo had an interesting ancestor — an animal the size of a car and named Doedicurus. Their findings were confirmed based on the DNA analysis of a 12,000-year-old fossil from Argentina, as published in the journal Current Biology on 22 February 2016. Scientists from Canada, Australia and the USA using age-determining techniques have shown that a tiny zircon crystal found on a sheep ranch in Western Australia is the oldest known piece of our planet, dating to 4.4 billion years ago. Their study was reported on 23 February 2014 in the journal Nature Geoscience. Three Canadian-built satellites including a suitcase-sized asteroid-hunting satellite, Near-Earth Object Surveillance Satellite (NEOSSat), were successfully launched into orbit on 25 February 2013 from the Satish Dhawan Space Centre in India. The NEOSSat will orbit approximately 800 kilometers above the Earth, searching for near-Earth asteroids and space objects that are difficult to spot using ground-based telescopes. Canadian researchers have discovered that prehistoric worms populated the sea bed 500 million years ago — evidence that life was active in an environment thought uninhabitable until now - as revealed on 26 February 2019. A prototype quantum radar that has the potential to detect objects which are invisible to conventional systems has been developed by a team of Canadian and international researchers. The new breed of radar, reported in Physical Review Letters on 27 February 2015, is a hybrid system that uses quantum correlation between microwave and optical beams to detect objects of low reflectivity such as cancer cells or aircraft with a stealth capability. Canadian film director Denys Arcand's French comedy-drama film The Barbarian Invasions won the Academy Award for Best Foreign Language Film in 2004 at the 76th Academy Awards ceremony. Scientists from Canada and their international colleagues have discovered the remains of microorganisms in Quebec, Canada that are at least 3.77 billion years old, providing direct evidence of one of the oldest life forms on Earth. Their findings were published in the journal Nature on 1 March 2017. Canadian researchers at the University of Guelph have identified an enzyme that helps Salmon fish to protect their hearts during a period of low oxygen (hypoxia) or after intensive exertion such as swimming upstream. The researchers found that Carbonic Anhydrase (CA) can help improve delivery of oxygen to the heart, as announced on 3 March 2016. Canadian and English researchers discovered the fossil remains of a 3.5-million-year-old camel on Ellesmere Island in Canada's northernmost territory, Nunavut. The camel was about 30 percent bigger than modern camels and was identified using a technique called collagen fingerprinting. The findings were detailed on 5 March 2013 in the journal Nature Communications. Brian McKeever won Canada’s first gold medal of the 2014 Sochi Winter Paralympics, taking the title in the men’s 20 km visually impaired cross-country race. A team of international scientists, including researchers from Canada, has discovered a vast reservoir of water under the Earth's mantle, 400-600 kilometers (250-375 miles) beneath the Earth’s surface. Their study, confirmed the finding based on the discovery of a rare mineral ringwoodite, was published in the journal Nature on 12 March 2014. Astronaut Chris Hadfield became the first Canadian commander of the International Space Station as he officially assumed control of the giant orbiting space laboratory on 13 March 2013. Canada was ranked as the world's seventh happiest country according to the annual UN report released on 15 March 2018. Canada ranked as the sixth happiest country in the world according to the 2016 United Nations (UN) World Happiness Report. Chris Klebl of Canada won gold at the 2014 Sochi Winter Paralympics in the men’s 10 km sitting cross-country race. Canadian school teacher Maggie MacDonnell won the annual $1M Global Teacher Prize at a ceremony in Dubai on 19 March 2017 for encouraging hope and acts of kindness in a remote Arctic village called Salluit in Quebec. Canada was ranked as the seventh happiest country on Earth, according to a United Nations Sustainable Development Solutions Network report published on 20 March 2017. More than 200 million years ago, volcanoes decimated a large numbers of marine and terrestrial species — including large sea reptiles and mollusks - which opened the door for the dinosaurs to take over millions of years later, according to a study published by scientists from Canada, Morocco and the USA on 21 March 2013 in the journal Science. Professor Janet Rossant of Canada received the 2018 L'Oréal-UNESCO For Women in Science Award from North America region for her outstanding research that helped us to better understand how tissues and organs are formed in the developing embryo. Canadian scientists and a team of international researchers have found that single microorganisms in the human gut have the ability to disassemble the most complex of carbohydrates in our diet. Their findings were published in the journal Nature on 22 March 2017. A pair of giant pandas arrived in Canada, officially loaned to Canadian zoos for 10 years by the Chinese government, on 25 March 2013. It is expected to increase the number of visitors to the zoos and help fund panda research in China. On 25 March 2012, Canadian filmmaker and adventurer James Cameron became the first solo explorer to reach the deepest point of the ocean - nearly seven miles, reaching the bottom of the Pacific Ocean's Mariana Trench southwest of Guam in a specially designed submarine in order to collect samples for scientific research and take still photographs and moving images. Artificial Intelligence (AI) experts Geoffrey Hinton and Yoshua Bengio of Canada and Yann LeCun of the USA won the 2019 Turing Award, sometimes referred to as "the Nobel Prize of computing”, for conceptual and engineering breakthroughs that have made deep neural networks a critical component of computing. Canadian and American researchers have discovered 508-million-year-old fossils of lobster-like marine creature with two pairs of eyes at a Marble Canyon site. Their findings were published on 27 March 2015 in the journal Palaeontology. Canadian archaeologists have discovered the oldest known human footprints in North America, left 13,000 years ago on the west coast of Canada, according to a new study published on 28 March 2018 in the journal PLOS One. Two University of Calgary researchers have developed a ground-breaking way to make new affordable and efficient catalysts for converting electricity into chemical energy. Their technology opens the door to homeowners and energy companies being able to easily store and reuse solar and wind power. Their findings were published in the journal Science on 28 March 2013. Canada’s Tessa Virtue and Scott Moir won gold in Free Dance skating event at the ISU World Figure Skating Championships in Helsinki on 1 April 2017. Changes in the biochemical balance of the ocean were a crucial factor in the end-Triassic mass extinction, during which half of all plant, animal and marine life on Earth perished, according to new research published on 1 April 2015 by Canadian researchers and their international colleagues. Canadian figure skaters Meagan Duhamel and Eric Radford came from second place in the Short Program to strike the Pairs gold at the 2016 ISU World Figure Skating Championships in Boston. On 4 April 1971, Ms Fran Phipps from Canada became the first woman to reach the North Pole. Canada on 6 April 2015 announced to provide $243.5 million for the Thirty Meter Telescope (TMT), an international project that will build one of the world’s largest and most advanced astronomical observatories in Hawaii. Canada won the World Men’s Curling Championship 2016 beating Denmark 5-3 in the final in the St. Jakobshalle in Basel, Switzerland. BlackBerry Passport, a mobile device developed by Canadian wireless equipment company BlackBerry Limited, won the prestigious 2015 Red Dot Best of the Best design award. An international team of scientists, including researchers from Canada, has excavated 190-million-year-old dinosaur embryos in China. The fossils unearthed in China belonged to Lufengosaurus, a long-necked, plant-eating dinosaur known for its gigantic size, with adults growing up to 9m (30ft) long. Their findings were published on 10 April 2013 in the journal Nature. Canadian researchers at the University of Waterloo have captured the first composite image of a dark matter bridge that connects galaxies together. The composite image, which combines a number of individual images, confirms predictions that galaxies across the universe are tied together through a cosmic web connected by dark matter that has until now remained unobservable, as revealed on 12 April 2017. Michael Crummey, a Canadian novelist, won the prestigious Commonwealth Writers' Prize (Best Book - Caribbean and Canada) in 2010 for his novel “Galore”. Canada unveiled heavy-vehicle emissions rules on 13 April 2012 that aim to make big trucks and buses up to 23 percent less polluting by 2018. Canada on 15 April 2015 signed a contract to supply seven million pounds of uranium concentrate to India over the next five years for the generation of electricity. Researchers at McGill University in Canada have found that a concentrated extract of maple syrup makes disease-causing bacteria more susceptible to antibiotics, according to laboratory experiments at the university revealed on 16 April 2015. Marilyn Baptist of Canada won the 2015 Goldman Environmental Prize for leading her community in defeating one of the largest proposed gold and copper mines in British Columbia that would have destroyed Fish Lake—a source of spiritual identity and livelihood for the Xeni Gwet’in. Canadian activist Sheila Watt-Cloutier was awarded the prestigious Champions of the Earth Award by the United Nations Environment Programme (UNEP) on April 19, 2005. She was recognized for her energetic efforts for the Inuit peoples whose lives are directly and most immediately threatened by the change in the world's climate. Professor Graham A.C. Bell from the McGill University, Canada on 23 April 2014 was elected as a foreign honorary member of the American Academy of Arts & Sciences for his contributions in Evolutionary and Population Biology and Ecology. Canadian musician Grimes was honored with the Webby Artist of the Year Award at the 17th Annual Webby Awards announced on 30 April 2013 in recognition of her ability to harness the power of the Web to engage and inspire millions of online fans. University of Toronto, Canada researchers have developed a handheld 3D skin printer that deposits even layers of skin tissue to cover and heal deep wounds, as revealed on 2 May 2018. Canadian researcher along with a team of international scientists has discovered fossil remains of a new species of meat-eating dinosaur in the northwestern corner of China. The dinosaur, Aorun zhaoi, was only a few feet in length and lived during the Late Jurassic Period nearly 161 million years ago, according to a study published on 3 May 2013. Canada ranked as the tenth most tourism-friendly country in the world in the 2015 World Economic Forum’s Travel and Tourism Competitiveness Index. Montreal in Canada was named as the world's fourth best student city, according to the fifth edition of the QS Best Student Cities Ranking published on 9 May 2018. Canadian scientists from the Royal Ontario Museum (ROM) have identified and named a new species of armoured dinosaur, Zuul crurivastator. Research on the new species is published in the 10 May 2017 issue of the open-access journal Royal Society Open Science. Jeanne Sauvé was the first female Governor-General of Canada. Sauvé assumed office as the 23rd Governor-General of Canada on May 14, 1984. Canada has created the largest area of protected boreal forest in the world in Alberta, following an official announcement on 15 May 2018 that set aside more than 13,600 square kilometres of land - an area twice the size of Belgium - across much of northeast Alberta. Raymond Wang of Canada won US$75,000 Top Prize at the 2015 Intel International Science and Engineering Fair for engineering a new air inlet system for airplane cabins to improve air quality and curb disease transmission. Canadian and English scientists have discovered water dating back 2.6 billion years, by far the oldest ever found on the planet, in a Canadian mine. Their findings were published on 15 May 2013 journal Nature. Image MAXimum better known as IMAX, is a motion picture film format, created by the Canadian IMAX Corporation. The first ever IMAX film Tiger Child was released on May 15, 1970 at Expo '70 in Osaka, Japan. Canadian researchers and their international colleagues have uncovered that ancient giant ground sloth Mylodon darwinii — which went extinct approximately 10,000 years ago — is a close relative of the modern two-fingered sloth. Based on their DNA analysis the research, published on 16 May 2018 in the Proceedings of the Royal Society B, suggests the two species diverged from one another approximately 22 million years ago. Canadian team won the first prize in the Alert-Alert category at the 2014 NASA’s International Space Apps Challenge for their Skywatch app, a visual representation of data collected from observatories around the world in near real time. Canada won the ice hockey world championship beating defending champions Russia 6-1 in the final in Prague on 17 May 2015. Canadian climber Jay Patry successfully reached the top of Mount Everest and its neighbouring peak, Mount Lhotse, in less than 24 hours on 21 and 22 May 2018. Canadian writer Riel Nason was announced as the regional winner for Canada and Europe of the Commonwealth Book Prize on 21 May 2012 for her debut novel The Town that Drowned. Emma Donoghue, a Canadian-Irish novelist, won the prestigious Commonwealth Writers' Prize in 2011 for her novel “Room”. In this novel, Ms. Emma told a story from the perspective of a five-year-boy who is being held captive in a small room along with his mother. Canadian scientists and their international colleagues have discovered 7.2 million year old pre-human remains in the Balkans, as detailed in the journal PLOS ONE on 22 May 2017. Canada retained their Ice hockey world championship title after beating Finland 2-0 in the final in Moscow on 22 May 2016. Canadian film director Xavier Dolan won the Grand Prix at the 69th Cannes Film Festival for his film Juste la fin du monde on 22 May 2016. Canadian film director Xavier Dolan won the 2014 Cannes Jury Prize for his film Mommy. Canadian professional racing cyclist Ryder Hesjedal won the 95th Giro d'Italia, one of cycling’s three Grand Tour events, on 27 May 2012. Ryder became the first Canadian to win a Grand Tour in cycling. Deni Yvan Béchard from Canada won the prestigious Commonwealth Writers' Prize 2007 in Overall Best First Book category for his novel Vandal Love. The novel talks about generations of an unusual French-Canadian family across North America and their struggle. Julie Payette, a female astronaut from Montreal, flew on the twenty-sixth flight of Space Shuttle Discovery from May 27 to June 6, 1999. During the mission the first manual docking of the shuttle to the International Space Station (ISS) was performed. She became the first Canadian to go on board the Station and to participate in an ISS assembly mission. Brenda Milner of Canada, John O’Keefe of England, and Marcus E. Raichle of the USA jointly won the prestigious 2014 Kavli Prize in Neuroscience for the discovery of specialized brain networks for memory and cognition. The Castle Rock Ridge Wind Farm, located in the town of Pincher Creek in Canada’s southwestern Alberta region, has been connected to the grid, according to a statement released on 31 May 2012. Canada ranked as the eighth most peaceful country in the world, according to a report published by the Institute for Economics and Peace (IEP) on 1 June 2017. After 55 days, Canadian Eric McNair-Landry and Belgian polar explorer Dixie Dansercoer succeeded in becoming the first polar explorers to fully circumnavigate the Greenland ice sheet. On 4 June 2014, on Day 56, they completed the expedition with a record total distance of 4,044.9km. Remains of an ancient forest fire preserved in stone have been discovered in southern Saskatchewan, Canada. The 66-million-year old forests recovered from fires in the same manner they do today, according to an official announcement on 5 June 2014 by researchers from the McGill University and the Royal Saskatchewan Museum. Canada was ranked as the sixth most peaceful country in the world according to the 2018 Global Peace Index (GPI) produced by the Institute for Economics and Peace (IEP). Canada became the proud host of the 2015 FIFA Women's World Cup. The genetic blueprint of the Eucalyptus grandis (flooded gum) has almost been sequenced by a team of international researchers, including scientists from Canada. The five-year effort to analyze the 640 million base-pair genome was reported on 11 June 2014 in the journal Nature. Canada and South Korea on 12 June 2014 confirmed the Text of Final Agreement of the Canada-Korea Free Trade Agreement (FTA). It is Canada's first FTA with an Asia-Pacific market. Canada, Mexico and the United States won the right to host the 2026 FIFA World Cup after securing greater number of votes from the FIFA member nations on 13 June 2018. Scientists at the University of Manitoba along with their international colleagues have shed new light on how diving mammals, such as the sperm whale, have evolved to survive for long periods underwater without breathing. The team identified a distinctive molecular signature of the oxygen-binding protein myoglobin in the sperm whale and other diving mammals, which allowed them to store enough oxygen to hold their breath for up to an hour. Their findings were published on 14 June 2013 in the journal Science. Canada ranked as the seventh most peaceful country in the world at the 2015 Global Peace Index published by Institute for Economics & Peace. University of Alberta Canada paleontologists have discovered a new species of marine lizard, called Primitivus manduriensis, that lived 70 to 75 million years ago, with its muscle and skin remarkably well preserved.The fossil was found in Puglia, Italy and detailed in Royal Society Open Science on 20 June 2018. Kim Campbell was Canada's first female Prime Minister. She started as the 19th Prime Minister of Canada from June 25, 1993. She was also the first woman ruler in North America. [Source (Book): The politics of Kim Campbell: from school trustee to Prime Minister By Murray Dobbin]. The CN Tower, a communications and observation tower in Toronto, was classified as one of the Seven Wonders of the Modern World by the American Society of Civil Engineers. The tower, one of the tallest in the world, was officially opened to the public on June 26, 1976. The Royal Astronomical Society of Canada designated Wood Buffalo National Park, straddles the Alberta - Northwest Territories boundary, as Canada's newest and the world's largest Dark Sky Preserve on 28 June 2013. With an area of 44,807 km2, it is larger than all dark sky sites in the world combined. Through this recognition, the park is committed to protecting the night environment from the impact of artificial lighting for the park’s large populations of bats, night hawks and owls, as well as providing opportunities for visitors to experience the Northern lights. Signs of the oldest animal known in existence - a centimetre-long slug whose fossilised tracks in Uruguay are 585 million years old - has been unearthed. The University of Alberta researchers reported the findings in the June 28, 2012, issue of the journal Science. Canada on 30 June 2014 launched two new satellites, CanX-4 and CanX-5, into space from the spaceport of Sriharikota, India. The Grand-Pré national historic site in Nova Scotia, Canada was added to UNESCO’s World Heritage List on June 30, 2012. Pimachiowin Aki (“The Land That Gives Life”) in Canada, a forest landscape crossed by rivers, was inscribed on the UNESCO's World Heritage List on 1 July 2018. 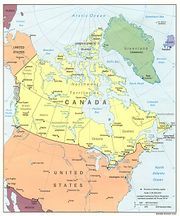 On July 1, 1867, the British government (under Queen Victoria) approved a plan which allowed Canada to become an independent country with its own government. It is Canada's national day and also commonly known as "Canada's birthday". The day celebrates the union of the British North American provinces into one nation called Canada. University of Alberta, Canada neuroscientists have identified the neural circuit that may underlie intelligence in birds, according to their study published in Nature on 2 July 2018. The Joggins Fossil Cliffs, a 689 ha palaeontological site along the coast of Nova Scotia (eastern Canada), have been described as the “coal age Galápagos” due to their wealth of fossils from the Carboniferous period (354 to 290 million years ago). On July 7, 2008 the Joggins Fossil Cliffs was inscribed on the United Nations Educational, Scientific and Cultural Organization (UNESCO) World Heritage List. Home telephones went on sale for public use in Canada on July 10, 1877. Then Prime Minister of Canada, Alexander Mackenzie, was the first to make a commercial telephone call in Canada. A Canadian-built helicopter that is powered by a human riding a bicycle has become the first winner of a decades-old $250,000 Sikorsky prize. The American Helicopter Society had never given out its Igor Sikorsky Human-Powered Helicopter Award—initiated 33 years ago—until the team from the University of Toronto snatched it, according to an official announcement on 11 July 2013. Canadian students won two gold, one silver and three bronze medals in the prestigious 2014 International Mathematical Olympiad (IMO) held in Cape Town, South Africa. Canadian scientists along with an international team of researchers have successfully sequenced the genomes of 201 microbes to find out more about the role these tiny, single-celled organisms play in our environment. This insight into the genetic code has also helped the team to draw up a more detailed version of the microbial family tree. Their findings were published on 14 July 2013 in the journal Nature. George W. Orton became the first Canadian to win an Olympic gold medal on July 15, 1900. It was also Canada's first ever Olympic medal. Orton won the medal in the men's 2500 metres steeplechase race. The Canadian robotics team won a gold in the Dr. Mae Jemison Award for International Unity category at the FIRST Global robotics competition in Washington DC on 16 July 2017. Mistaken Point, the fossil site located at the south-eastern tip of the island of Newfoundland, in eastern Canada, was inscribed on UNESCO’s prestigious World Heritage List on 17 July 2016 at the 40th session of the World Heritage Committee held in Istanbul, Turkey. The 1976 Summer Olympic Games were held in Montreal, Canada from 17 July to 01 August. It was the first time Canada hosted Summer Olympics. A group of scientists from Canada, China, the United States and Australia has discovered a 99-million year old snake preserved in a piece of amber from the Hukawng Valley, in north Myanmar's Kachin State. The snake, lived during the age of dinosaurs, was described in Science Advances on 18 July 2018. Canada's Air Transat was named as the World's Best Leisure Airline at the prestigious 2018 Skytrax World Airline Awards. Canadian film director James Cameron won the 2012 Australian International Design Award in the "heavy machinery" category, for his role in developing the Deepsea Challenger Research Submersible. Designed and manufactured by four Australian companies, the craft is the first single-occupant research submersible capable of safely taking a person to the world's deepest abyss. Canadian inventor Henry Woodward and his partner Mathew Evans patented an electric light bulb on 24 July 1874. Later, American inventor Thomas Edison bought their patent to further his own research. smartARM team of Canada won the grand prize at the 2018 Microsoft Imagine Cup for creating a robotic hand prosthetic, using Microsoft Azure Computer Vision, Machine Learning and Cloud Storage, that uses a camera embedded in its palm to recognise objects and calculate the most appropriate grip for an object. Canadian swimmer Kylie Masse broke the world record in 100-metre backstroke on 25 July 2017 at the world aquatics championships in Budapest, becoming the first female Canadian swimmer to ever win a world title. Canada’s crime rate dipped to its lowest level in 40 years in 2012, according to a national statistics agency study reported on 25 July 2013. The Canadian Space Agency (CSA) unveiled Canada's contribution to the James Webb Space Telescope, successor to the Hubble Space Telescope, on 25 July 2012. The CSA is contributing a two-in-one instrument that will direct the telescope precisely, allowing it to study stars and planets forming in other stellar systems. Karen Diane Baldwin won the 1982 Miss Universe title representing Canada at the age of 18 on 26 July 1982. Lisa Wong of University of British Columbia, Canada won the Microsoft Student Partner of the Year Award at the 2016 Microsoft Imagine Cup World Championship. Canadian Rosie MacLennan won gold medal in the Women's Trampoline at the London Olympics on 4 August 2012. Researchers from Canada and an international team have set out the first comprehensive map of mutational processes behind the development of tumors - work that should in future lead to better ways to treat and prevent a wide range of cancers. Their study, published on 14 August 2013 in the journal Nature, discovered the genetic imprints and signatures left by DNA-damaging processes that lead to cancer. Dr. David Clarke, staff neurosurgeon at the Queen Elizabeth II Health Sciences Centre (QEII) in Halifax, Canada successfully performed world's first simulation-based brain surgery on 20th August 2009. A lion-sized dinosaur must have stalked its prey like cat, used guile and agility to outwit their feathered prey, a Canadian-Chinese research team has found. The research was published in the journal PLoS One on 29 August 2012 based on the results of a careful analysis of the stomach remains of two Sinocalliopteryx fossils. Canada's Derek Drouin won gold in high jump at the 2015 world track and field championships in Beijing. Canada and Serbia on 1 September 2014 signed a foreign investment promotion and protection agreement (FIPA). A FIPA is a treaty designed to protect Canadian investment abroad and promote foreign investment in Canada through reciprocal, legally binding provisions. Canada was voted as the world’s second most beautiful country by the influential travel publisher Rough Guide’s readers, as published on 4 September 2017. Canada ranked as the seventh most generous nation in the Charities Aid Foundation (CAF) 2017 World Giving Index. The index measures the average percentage of people in each country who donate money, volunteer or help a stranger. A collaborative effort by researchers from Canada and their international colleagues has identified compounds that act on a novel target in the malaria parasite, Plasmodium falciparum. Their experiments that cured mice of the disease were detailed in the journal Nature on 7 September 2016. After 25 years, Canada and the United States signed a renewed Great Lakes Water Quality Agreement on 7 September 2012 to improve Great Lakes water quality. Canadian and German physicists have created the first ever superconducting graphene sample by coating it with lithium atoms. Their findings, expected to have significant cross-disciplinary impact, were published in the journal Proceedings of the National Academy of Sciences on 8 September 2015. Cindy Nicholas from Toronto swam across the English Channel, an arm of the Atlantic Ocean that forms a channel between France and Britain, in both directions nonstop on September 8, 1977. Cindy became the first woman to complete the two-way crossing and earned the nickname Queen of the Channel. A team of international scientists, including researchers from Canada, has discovered a new species of human relative in a cave system in South Africa, and named it Homo naledi. Their findings were published in the journal Elife on 10 September 2015. Canadian scientists have discovered mummified remains of two ice age animals — a caribou calf and a wolf pup — near Dawson City, Yukon. Both carbon-dated to more than 50,000 years old, as revealed on 13 September 2018 by palaeontologist Grant Zazula. Canada ranked as the 7th most democratic country in the world according to the Democracy Index 2014 published by the Economist on 15 September 2015. Canadian aerospace and transportation company Bombardier Inc's CSeries jetliner successfully completed its first flight on 16 September 2013, a major milestone in the company’s highly anticipated development program that will provide operators with an all-new family of aircraft specifically designed for the 100- to 149-seat market segment. Nikki Fraser, serves as the Youth Representative from the British Columbia Native Women’s Associations and the National Youth Representative for the Native Women’s Association of Canada, was recognized as one of the 2016 UN Young Leaders for the Sustainable Development Goals. Canadian student Hayley Todesc was named the 17-18 age category winner at the Google Science Fair 2014 in San Francisco for her project Waste to Water: Biodegrading Naphthenic Acids using Novel Sand Bioreactors. Her project uses a sustainable and efficient method to break down pollutant substances and toxins found in tailing ponds water in her hometown. Ann Makosinski from Canada was announced as the winner of the 2013 Google Science Fair Competition in the 15-16 age category for her project The Hollow Flashlight. Using Peltier tiles and the temperature difference between the palm of the hand and ambient air, Ann designed a flashlight that provides bright light without batteries or moving parts. Professor Ian Burton at the University of Toronto, Canada was awarded the Laureat d’Honneur 2016 by the International Geographical Union for his pioneering work on the understanding of disasters. Canada became the third country to design and build its own satellite when Alouette 1, first Canadian satellite, was placed in orbit on September 28, 1962. Canada's first satellite Alouette 1 was launched on September 29, 1962. Alouette 1 was the first satellite launched by a country other than the United States or Soviet Union. Alouette's mission lasted for 10 years and used to study the ionosphere. Canada defeated Team Europe 2-1 in the second game of a best-of-three finals series on 30 September 2016 to win the Ice Hockey World Cup 2-0. Canada ranked as the 13th most competitive country in the world, according to a World Economic Forum report released on 30 September 2015. This report, provides insight into the drivers of a country’s productivity and prosperity, suggests Canada has been nurturing innovation and talent. The Nobel Prize in Physics 2018 was jointly awarded to Donna Strickland of Canada, Gérard Mourou of France and Arthur Ashkin of the USA for groundbreaking inventions in the field of laser physics. Ralph M. Steinman from Canada was awarded one-half of the 2011 Nobel Prize in Physiology or Medicine for his discovery of the dendritic cell and its role in adaptive immunity. Dr. Marc Garneau became the first Canadian in space when he participated in mission STS-41G from October 5 to 13, 1984. Professor Arthur B. McDonald of Canada and Professor Takaaki Kajita of Japan jointly won the Nobel Prize in Physics for 2015 for the discovery of neutrino oscillations, which shows that neutrinos have mass. Canada and Malaysia have signed a security agreement - Canadian Prime Minister Stephen Harper announced on 6 October 2013 - that will enhance security cooperation between the two countries and help address the threats of terrorism, human smuggling and organized crime in Southeast Asia and beyond. Canadian author Alice Munro was awarded the 2013 Nobel Prize in Literature for her mastery in contemporary short story. Canadian researchers have developed T-CUP, the world’s fastest camera, capable of capturing ten trillion frames per second, as revealed on 11 October 2018. Researchers from Canada, Germany and the USA have discovered the smallest skull of a dinosaurs belong to the group of long-necked dinosaurs called diplodocids, as detailed in Scientific Reports on 11 October 2018. Canadian photographer Don Gutoski was named the 2015 Wildlife Photographer of the Year at London’s Natural History Museum for his image, Tale of Two Foxes, capturing a deadly encounter between a red fox and an Arctic fox. The Pugwash Conferences on Science and World Affairs, an international organization - founded in Canada to bring together, from around the world, influential scientists, scholars and public figures concerned with reducing the danger of armed conflict and seeking cooperative solutions for global problems, jointly won the Nobel Peace Prize in 1995 for their efforts towards nuclear arms disarmament. Professor John C. Polanyi from the University of Toronto jointly awarded the 1986 Nobel Prize in chemistry for their contributions concerning the dynamics of chemical elementary processes. Canadian poet, critic and novelist Margaret Atwood received the prestigious international Franz Kafka literary prize at a ceremony in Prague on 17 October 2017. Canada and the European Union on 18 October 2013 reached a political agreement on the key elements of a Comprehensive Economic and Trade Agreement (CETA) after months of intense negotiations. It will be the first free trade agreement between the European Union and a G8 country designed to boost growth and employment. Scientists from Canada and their international colleagues have unearthed fossils in Mongolia’s Gobi Desert that have allowed them for the first time to build a complete picture of one of the most unique dinosaurs, Deinocheirus mirificus. Their study was published on 22 October 2014 in the journal Nature. University of British Columbia researchers have invented a safe, efficient technology to wirelessly charge electric vehicles using a frequency 100 times lower than what's used now and with negligible exposed electric fields, according to an official announcement on 26 October 2012. Canada and the United States on 26 October 2012 announced they were launching a joint cybersecurity plan to protect their digital infrastructure from online threats. The action plan, under the auspices of the US Department of Homeland Security and Public Safety Canada, aims to better protect critical digital infrastructure and improve the response to cyber incidents. On 29 October 2012 world's first biofuel flight, a specially equipped Dassault Falcon 20 business jet developed by Canada’s National Research Council, powered by 100% plant oil derived from oilseed crops flew over Ottawa. This landmark flight was the first civilian plane powered completely by biofuels. Canada signed a landmark free trade deal with the European Union on 30 October 2016 that is expected to remove 99% of tariffs and increase bilateral trade by €12 billion per year. Canada Topped the List of World’s Most Positive Countries for the First Time Ever. Canada ranked as the second most positive country at the World’s Most Positive Countries 2017. Canada ranked as the fifth most positive country at the World’s Most Positive Countries 2016. Canada ranked sixth in the list of the World’s Most Positive Countries 2013. Canada ranked seventh in the list of the World’s Most Positive Countries 2012. Canada ranked eighth in the list of the World’s Most Positive Countries 2011 revealed by Daily Positive (D+) published on November 1, 2011. Canada took the fifth place at the Legatum Prosperity Index 2016, making it as one of the best places in the world to live. A new dinosaur, about 30ft (9m) long, that roamed the Earth 80 million years ago has been discovered in southern Utah, according to a study published by Canadian and American researchers on 6 November 2013 in the journal Plos One. The predator was named Lythronax argestes which means "king of gore". Canada’s first transcontinental railway was completed, six years ahead of schedule, on November 7, 1885. The track was recorded as 2,875 miles or 4,600 km long. Canadian Nobel laureate Arthur McDonald, representing the Sudbury Neutrino Observatory (SNO) Collaboration at the Queen’s University, won the prestigious Breakthrough Prize in Fundamental Physics on 8 November 2015. Mita Dasog of Canada was awarded the 2013 Green Talents Award in Berlin for her research on nanomaterials made of one of the most abundant elements on earth, silicon, in order to make our computers and cell phones more energy efficient. Canadian scientists have identified a new species of horned dinosaur, Xenoceratops foremostensis, from Alberta, Canada from fossils at the Canadian Museum of Nature in Ottawa originally collected in 1958. The research describing the new species was published on 8 November 2012 in the Canadian Journal of Earth Sciences. Canada was admitted as a member of the United Nations (UN) on 9 November 1945. Voltera V-One, a custom circuit board printer developed by University of Waterloo engineering students, won the top prize in the 2015 International James Dyson Award competition - beating out a record 710 entries from 20 countries. Voltera is the first Canadian team to capture the prestigious award that comes with a prize of about $60,000 (CAD) for the team and $10,000 for the University’s Faculty of Engineering. Canada ranked fourth in the 2015 Charities Aid Foundation's World Giving Index which measures each country's charitable behavior. Canadian model Jessica Nicole Trisko won the 2007 Miss Earth contest. She was the first Canadian to win the title on November 11, 2007 in Quezon City, Philippines. Tessa Virtue and Scott Moir of Canada won the ice dance title at the NHK Trophy for the second straight year with a strong free dance on 12 November 2017. Canadian author Wade Davis won Britain’s leading nonfiction book prize, Samuel Johnson Prize, for his book Into the Silence: The Great War, Mallory and the Conquest of Everest on 12 November 2012. Canada and Kazakhstan signed a Nuclear Cooperation Agreement (NCA) on 13 November 2013 in sphere of peaceful nuclear energy. The nuclear cooperation agreement – together with the administrative arrangements – would enable Canadian and Kazakh companies to export and import controlled nuclear materials, equipment and technology under safeguards applied by the International Atomic Energy Agency. Researchers from the University of Western Ontario’s Centre for Brain and Mind was able to talk, with the help of functional MRI, to a Canadian man presumed to be in a permanent vegetative state for more than a decade. It's the first time an uncommunicative, severely brain-injured patient has been able to give answers clinically relevant to their care, as first reported on 13 November 2012. The Shuttle Remote Manipulator System (SRMS), also known as Canadarm-yet another successful space project in Canada, is a robotic arm to help inspection and deployment of the Space Shuttles. The Canadarm was first used by National Aeronautics and Space Administration (NASA) on November 13, 1981 in a space shuttle mission named STS-2. Canada ranked third at the Freedom on the Net 2016 index compiled by Freedom House. This index is compiled based on the extent of freedom the citizens of 65 countries experienced on the Internet. Canadian and French Astronomers have spotted a Rogue Planet - wandering the cosmos without a star to orbit - 100 light-years away from earth. The planet, dubbed CFBDSIR2149-0403, is outlined in a paper published on 14 November 2012 in Astronomy and Astrophysics. Photographer Jean-Simon Bégin of Canada won the Second Prize at the 2017 National Wildlife Federation Photo Contest in the Birds category. Canada’s first all-season highway linking the country’s south to the Arctic Ocean officially opened on 15 November 2017. The $300m gravel road stretches from the regional hub of Inuvik to the coastal hamlet of Tuktoyaktuk in the Northwest Territories. Canadian researchers, for the first time, estimated the total volume of groundwater present on the Earth. The results show that we're using up the water supply quicker than it can be naturally replaced, as detailed in the journal Nature Geoscience on 16 November 2015. In 2012, a team of researchers lead by Nahum Sonenberg of McGill University in Montreal, Quebec have found a way of reversing the symptoms of autism in mice. Sonenberg and his colleagues did this by using a small molecule drug to disrupt the protein associated with hypersensitivity in autistic mice. While the results are encouraging they warn that a cure for autism in humans is still many years away. Canada's murder rate in 2013 and 2014 felt down to a near 50-year low, according to an official report published by Statistics Canada on 25 November 2015. Scientists from the University of Toronto have discovered a novel chemical lurking in the atmosphere that potentially has highest impact on global warming. The chemical – perfluorotributylamine (PFTBA) – is the most radiatively-efficient chemical found to date, breaking all other chemical records for its potential to affect climate, according to their study published in the journal Geophysical Research Letters on November 27, 2013. University of Alberta paleontologist Philip Currie unearthed a remarkably preserved, near-complete skeleton of a baby dinosaur, Chasmosaurus belli, in Alberta’s badlands, as announced on 29 November 2013. Canadian sprinter Andre De Grasse was awarded the Male Rising Star title at the IAAF Athletics Awards 2016. Alex Boisvert-Lacroix of Canada won the men's 500 meters gold at the Speed-skating World Cup on 4 December 2017 in Calgary. On 5 December 2007 researchers in McGill University's Department of Animal Science announced they have produced Canada's first cloned pigs. This success is to be used in research into diabetes, cardiovascular disease, and other ailments. A new species of semi-aquatic dinosaurs, nicknamed "Halszka" for Halszkaraptor escuilliei, that could kill prey on land and in water has been discovered by Canadian and a team of international scientists. Scientists made the discovery after studying a fossil which was found at Ukhaa Tolgod in southern Mongolia, as revealed in the journal Nature on 6 December 2017. The Government of Japan apologized on 8 December 2011 for the mistreatment of Canadian prisoners of war after the Battle of Hong Kong in World War II. It came on the 70th anniversary of Japan's invasion of Hong Kong in 1941. Canadian researchers and their international colleagues have discovered a new class of stem cells, raising hopes of a new era of regenerative medicine in which currently incurable illnesses are conquered using patients’ own cells. Their study was published in the journal Nature on 10 December 2014. Canadian Greta Cutulenco, CEO and co-founder of Acerta - a company whose AI platform works to ensure the quality and reliability of vehicle systems, was announced as winner of the 2018 Microsoft Female Founders Competition. A team of Canadian and South Korean engineers developed a new way to produce electrical power that can charge handheld devices or sensors that monitor anything from pipelines to medical implants. The discovery sets a new world standard in devices called triboelectric nanogenerators by producing a high-density DC current—a vast improvement over low-quality AC currents produced by other research teams, as detailed in the journal Nature on 11 December 2017. Canadian ice dancers Kaitlyn Weaver and Andrew Poje won gold in short dance at the ISU Grand Prix of figure skating final on 12 December 2014. A rare, mummified specimen of the duck-billed dinosaur Edmontosauraus regalis described in the Cell Press journal Current Biology on 12 December 2013 by researchers from Canada, Australia and Italy shows for the first time that those dinosaurs' heads were adorned with a fleshy comb, most similar to the roosters' red crest. Canadian scientist Katy Mackenzie’s photograph of TRIUMF’s, one of the world’s leading subatomic physics laboratories in Canada, main control room won the first prize at the prestigious 2015 InterActions Physics Photowalk competition. A team of scientists from Canada, England and the USA has discovered ancient, hydrogen-rich waters in Canada, South Africa and Scandinavia. The water, some of which is billions of years old, is found many kilometers beneath the ground, as presented in the journal Nature on 17 December 2014. A team of Canadian and American geologists has discovered a new species of bird, named Tingmiatornis arctica, in the Canadian Arctic. At approximately 90 million years old, the bird fossils are among the oldest avian records found in the northernmost latitude, and offer further evidence of an intense warming event during the late Cretaceous period, as detailed in the journal Scientific Reports on 19 December 2016. Canadian archaeologists have discovered a 3,800-year-old underwater garden with hundreds of blackened potatoes in British Columbia, Canada. Their findings were reported in the journal Science Advances on 21 December 2016. After detailed study of the meteorite found in California in April 2012, an international team of scientists, including researcher from Canada, reports it contains some of the oldest material in the Solar System. The research findings were published in the journal Science on 21 December 2012. Canadian-born James Naismith invented the sport of Basketball, one of the most popular sports in the world, when he posted 13 rules to the game on the International Young Men's Christian Association Training school's bulletin board and nailed two peach baskets to the gym balconies on December 21, 1891. Canadian adventurer Frederic Dion became the first person to reach the geographic South Pole alone by kite ski on 24 December 2014. Researchers from Canada, Brazil and Belgium have described the first known hybrid bird species to be found in the Amazon rainforest, as published in the Proceedings of the National Academy of Science (PNAS) on 26 December 2017. Through a series of genetic and other tests the team have revealed that the golden-crowned manakin -- first discovered in Brazil in 1957 but not seen again until 2002 - is in fact a hybrid species. This page was last edited on 15 April 2019, at 23:47.